Perfect for a quick weeknight meal! 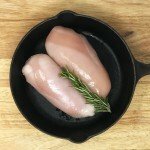 Boneless Skinless Chicken Breasts thaw quickly and total prep for this should take less than 15 minutes. place in a pre-heated 350 degree oven for about 30-40 minutes until the breasts are cooked to 145 degrees.